AUSTIN, Texas — It's a well-organized conspiracy. That is how Detective Carl Olavesen described the criminal masterminds behind a crime ring that is swiping cars from dealerships in Houston and selling them to victims statewide, including in Travis County. Detective Olavesen is with the Travis County Sheriff's Combined Auto Theft Task Force. The tools these criminals use aren't violent. Rather, they are sophisticated. "This is one of the best ones I have ever seen," he said when showing KVUE's Jenni Lee fake car titles. Detective Olavesen has seen his share of counterfeit car titles. But this latest batch is so good he said, "we've already had one make it through the DMV." 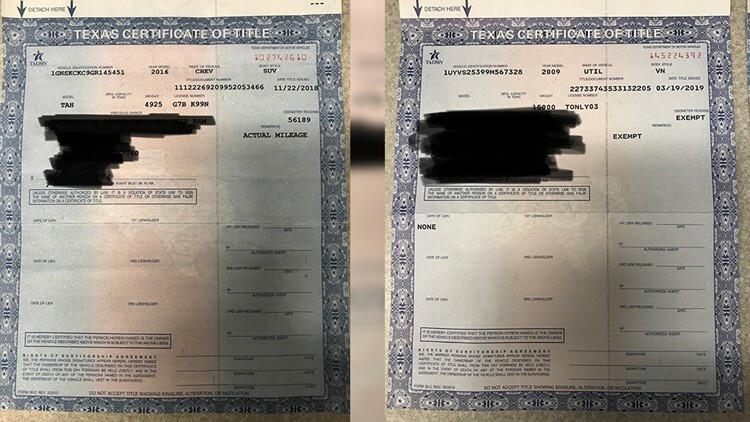 He's worried because criminals are using these fake car titles, forged driver's licenses, and other altered documents to sell stolen, high-end cars to victims in the Austin area. "They'll target the dealerships that have a large inventory," said the detective. "They'll test drive the vehicle, somewhere in that process they'll duplicate the key and then, at a later time, they'll steal that vehicle off that dealership lot." Detective Olavesen said because the lots are so large, the cars are sold before the dealership has a chance to report them stolen. Besides using fake documents, he tells us more about the criminals' MO. "You see in each of these cases the person whose name is on the title is not who you're meeting with. They're going to give you an excuse as to why that person can't meet you," he said. Looking at them side by side and it's hard to tell the real from the fake. The fake title is on the left, the real title is on the right. But one of the easiest ways to tell if its a real title is to hold it up to the light and look for the watermark of the State of Texas. Detective Olavesen said the criminals are selling newer-model, high-end vehicles, like a 2016 Tahoe, for way less than the asking price. One of the Austin-area victims paid $15,500. It's cash Detective Olavesen said she won't be getting back. Authorities say the criminals are posting the cars for sale on websites like Craigslist or Facebook. Detective Olavesen suggested using this website to check to see if the car you want to buy is stolen. But be warned, the car will still show up at the dealership if it has not been reported stolen yet, so buyers need to do their due diligence. Or if you want to check out the vehicle's history, click here. And here is the Travis County Auto Theft Task Force website.